Beyond providing data for all 32 NFL teams, PFF also supports network broadcasters with game-preview packets that are used to enhance the in-game experience for fans and viewers. This Packers-Vikings preview features the same information our broadcast partners use for team research and in-game production. 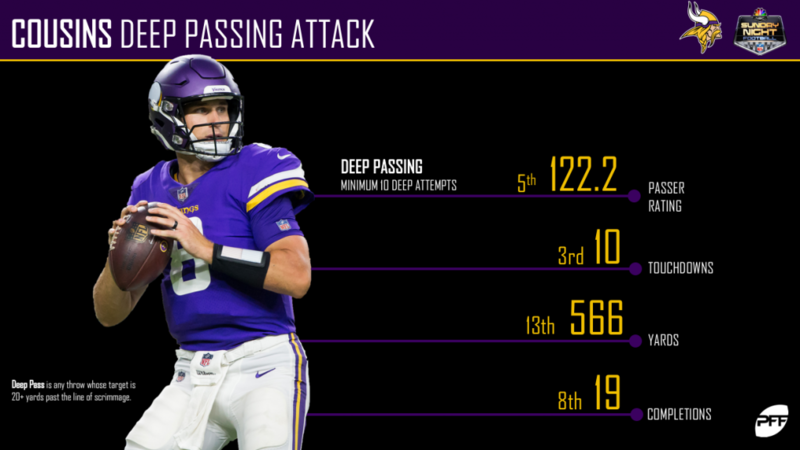 Kirk Cousins has been incredibly efficient on his deep passes this year. Wide receiver Adam Thielen has been Cousins’ favorite target so far this year. He leads the team in targets (112), receptions (85), yards (1013) and touchdowns (seven), while he also ranks 12th among all receivers with an average of 2.31 yards per route run. Danielle Hunter is making his presence felt in 2018. Through 11 weeks, he’s produced 48 total quarterback pressures – the third-most among edge defenders. Safety Anthony Harris turned in an elite game grade of 94.5 in Week 11, his second grade north of 94.0 this year. He’ll look to build on that great performance on Sunday night. 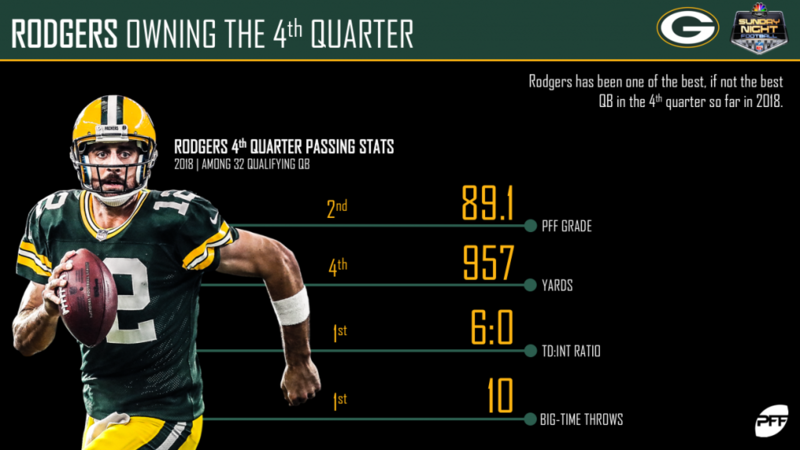 Aaron Rodgers is mounting an incredible 2018 campaign, but his numbers are even more impressive when you narrow it down to his fourth-quarter performance. Rodgers has yet to throw an interception in the fourth quarter. Davante Adams has seen 100 targets so far this year, which are the fifth-most among receivers. He’s turned those targets into 72 catches for 953 yards and nine touchdowns – all good for a WR rating of 131.8. Kenny Clark has been excellent rushing the passer, but his abilities do not stop there. He’s also produced 22 defensive stops against the run, which are the fourth-most among interior defensive linemen. Inside linebacker Blake Martinez has allowed an average of just 0.60 yards per coverage snap this year, which is second-best mark among all players at the position. PFF Greenline has projections for the spread, moneyline and over/under of the Vikings’ matchup with the Packers. Get its picks here.